“The Nutcracker”ballet is a holiday classic that sets the tone for the season at national opera houses and school stages across the world. Through beautiful music and charming choreography, it celebrates the holidays by taking audiences on an unforgettable journey with young Clara as she travels from her home on Christmas Eve to the Land of the Sweets. But dance lovers of all ages and abilities came to point their toes in Tchaikovsky’s ballet at the Chicago Cultural Center on Sunday. 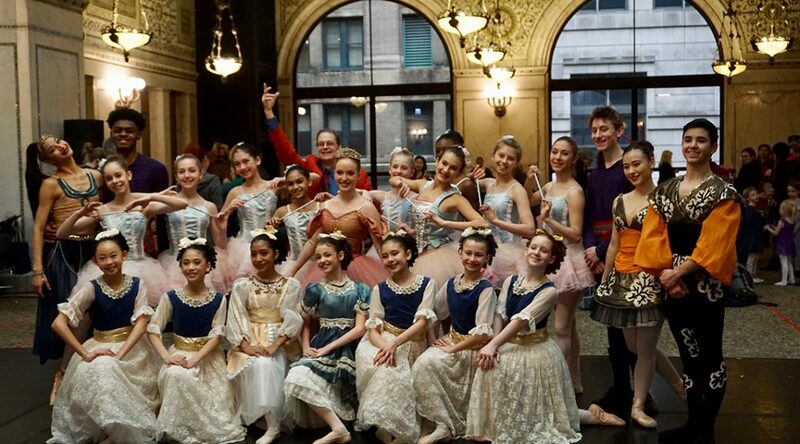 Participants learned the basic ballet positions and movements taught by members of Ballet Chicago at an optional lesson before joining in the performance of “The Nutcracker”. She joined the dozens of amateur dancers on stage who took roles with the Chicago Ballet performers, adding lots of energy and their most beautiful steps to the magic world of the Nutcracker. Music for “The Nutcracker” was provided by the symphonic band of Lakeside Pride Music Ensembles, one of Chicago’s premier performance groups for the LGBTQ community. Identifying herself as pansexual, Vahona Richardson, 49, had been volunteering with Lakeside Pride Music Ensembles since May, so as to “do something for the community” that she enjoyed. She said it was fun to be there watching little kids dance, and spending time with her “musical peers” at the same time. The role of Sugar Plum Fairy in ballet is played by the principal female dancer of a troupe. “It’s a lot of pressure, but in a good way,” Wittig said. She faced the stresses such as living up to the expectation, and trying to be as good as the multiple ballerinas who had played that role before. “I’m really grateful for the opportunity, but it’s also very scary,” Wittig said. Katherine Alvarado, lead “Arabian dancer” playing the role of Coffee in Land of Sweets, agreed. Stepping on a stage means “you carry the pride of all of your teachers standing behind you,” said the Ballet Chicago performer. Now 25, Alvarado decided to become a professional ballet dancer at 17, after dancing in ballets as an amateur. “The industry is very small,” she said, and because it is so small, the job openings are very limited.